Patty Wagstaff is one of the women to whom I owe a great debt of inspiration. In 1991, Patty, a former model, became the first woman to win the U.S. National Aerobatic Championships. She won again in 1992, and again in 1993. Aerobatics competition is incredibly demanding, and it requires a grueling practice schedule to reach competitive levels in the Unlimited Category. Competitors fly fire-breathing, special-purpose airplanes producing over 300 horsepower, and are subjected to inertial forces in excess of 9 G's positive and 8 G's negative. 8 G's negative means a 110 pound woman has 880 pounds of force trying to tear her out of her seat! In the midst of this roaring, tearing, body-wrenching, face-distorting crescendo of noise, vibration, and enormous and wildly fluctuating inertial forces, a pilot must fly with absolute precision. The penalty for a mistake can be swift and fatal: the "floor" for an Unlimited aerobatic sequence is only 100 meters above the ground! In the World Aerobatics Championships. women and men compete in different categories. Not so in the US: here they all compete in the same category. In the early days of this championship, it was unheard of for a woman to place anywhere near the top. It was big news when a woman made the top ten. In 1991, Patty changed all that. For the next three years, there wasn't a man in the country who could beat her in the biggest championship in the country, and you can be sure that many were trying! By the end of that period, women had become so competitive that five of the top ten finishers in the championship were women. This was all wonderfully inspiring for me. When people would look askance at me (this happened often!) when I told them I was building my own aerobatic airplane I could tell them truthfully that the best aerobatic pilot in the country was a woman! For some reason, reactions to this were quite varied: women loved it, while men became very quiet and stopped looking askance. Patty's routine, which can be seen at airshows throughout the country, is graceful, beautiful and simply awesome. 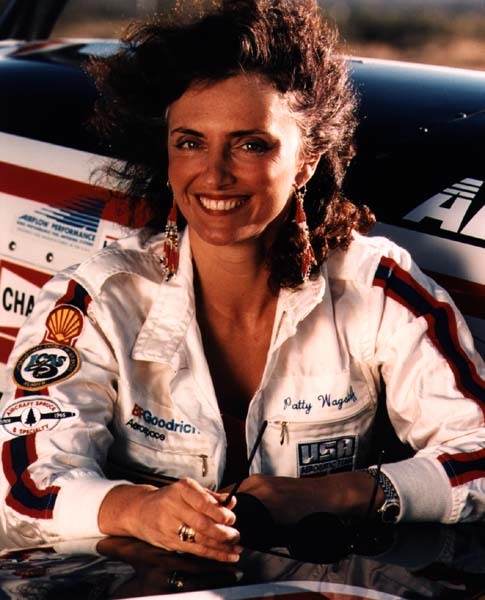 Patty was the highest-placing American in the 1996 World Aerobatic Championships, held in Oklahoma City. You can bet I was be rooting for her, and for the other women on the US team: Diane Hakala, Debbie Rihn-Harvey, Ellen Dean, and Linda Meyers Morrisey! A video clip of Patty flying her aerobatic sequence is available at the Experimental Aircraft Association's Ultimate Flights page. See the US Aerobatics Team 1996 page for more photos of the top US women aerobatic pilots. Check out Patty's own Web site. Photos by Jim Koepnick, EAA.